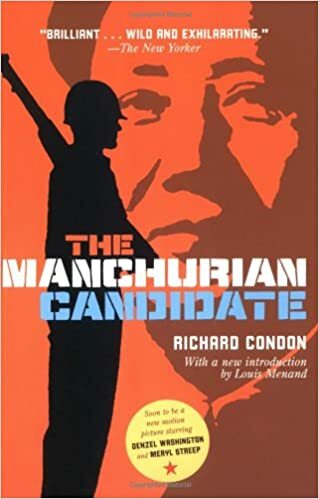 The Manchurian Candidate by Richard Condon was listed as one of the top ten best bad books of 1959 by Time Magazine. That’s a good way to describe the novel–it’s a very good bad book. Today, the story is known primarily from the two movie adaptations: the ill-fated 1962 version starring Frank Sinatra and Angela Landsbury and the 2004 version starring Denzel Washington and Meryl Streep. I can speak only for the Sinatra/Landsbury version which is terrific. Angela Landsbury plays the meanest mother ever to appear on screen. But, as mean as she is, she’s June Cleaver next to the mother as written in the novel. She’s so mean, she cannot be named. She’s simply Raymond’s mother throughout the book. If she had a name, any reader who happened to have a mother with that name would soon need therapy. Because this is a good bad book, Raymond’s mother’s meanness is part of the fun. We are horrified by what she does but also a bit delighted, too. Watching her manipulate both her husband and her son, one into the U.S. Senate, the other into marriage, all so she can get herself one step closer to the White House which she will rule as a pupper master, is a guilty pleasure. Even guilty pleasures are still pleasures. Think of her as a modern day Lady MacBeth. If she has to force a few people into suicide to gain power, it’s just the price she has to pay. If one of those people is her own son, it’s a heavy price, but one that must be paid none-the-less. There’s a plot about communists brainwashing American soldiers that was once topical but seems silly now. While we do feel for Raymond and want him to find a means of escape, when his mother is off-stage we’re impatient for her to return. As the layers of her corruption are revealed, the reader’s jaw drops a little more, and the pages keep turning. Raymond’s mother is what makes The Manchurian Candidate a good book. However, she’s also what makes it a bad book. While she is fun to hate for a while, ultimately she’s too much a collection of symptoms without a motivation. Why is she doing all she does? Lust for power is understandable, but Raymond’s mother’s lust includes blackmail, procuring, murder, treason, and one more sin that I won’t spoil. Something too extreme for the 1962 movie adaptation. A character this corrupt needs more depth. What she does is not much more extreme that what Lady MacBeth does, but Lady MacBeth gets a mad scene which brings her back within the realm of sympathetic, believable humanity. Raymond’s mother just gets meaner and meaner. As she does, her character becomes harder and harder to believe, making The Manchurian Candidate a very good bad book. I first ran this review on my old blog Ready When You Are, C.B. back in 2011. Since then we have had a few “mean” women come along that may give the mother a run for her money. Gone Girl, House of Cards, we could probably make a pretty good list if we put our minds to it over a latte or two. I’ve never watched the American version of House of Cards but I would say that Gone Girl is a very good bad book in much the same way The Manchurian Candidate was. There’s just something many of us enjoy about watching a manipulative woman at work. Guilty pleasures are still pleasures after all. I love that description: “a very good bad book” – so true so often!